other departments, applying for grants and putting new programs in place that will help save lives in the crucial seconds before medical personnel can arrive on scene. From enforcement teams in the summer, to a grant that will provide money to train officers in a variety of mental health situations, Windham Police Department is treating the opiate epidemic as a serious issue that must be addressed now. For two summers, the Windham Police Department has teamed up with Gorham Police Department to work with the Maine Drug Enforcement Agency (MDEA) and High Intensity Drug Trafficking Areas (HIDTA) to focus attention on Windham and Gorham. The officers handed out possession charges and warrants for furnishing and trafficking in drugs. From mid-June to now officers made 22 cases, confiscating Suboxone, Fentanyl and other drugs. Nine cases were in Gorham and 13 were Windham cases. Many of the cases included Fentanyl brought here by people from the northeast region of Massachusetts, according to Schofield. In one case, nine fingers of Fentanyl was seized with the potential street value of $10,000. The additional officers came from the school resource officers (SRO) that aren’t needed in the schools during the summer. because an officer should not be out there on his own,” said Schofield. None of the cases were high level dealers. The goal wasn’t to generate cases, but to stop the flow of drugs into the two towns. The smaller cases are also how larger investigations are spawned, said the chief. very real in this area,” he added. Towns in the area all have similar numbers and programs when it comes to drug cases. Westbrook has a new Community Approach to Stopping Heroin (CASH) program dedicated to stopping the heroin and drug epidemic gripping that city. “We are always looking at if we are using our resources as effectively as we can. It’s been effective the last two summers,” Schofield said. In the last six months there have been five drug overdose deaths in Windham, according to Schofield. There has been an increase in pharmacy robberies, bank robberies, car thefts and burglaries and it can all trickle back into the drug problem in society. Schofield calls this significant. “There is a medical cost to the opiate abuse disorder. This opiate crisis is the biggest issue I’ve dealt with in my career,” he added. Part of the opiate and street drug problem stems from that street drugs are cheaper to get than Oxy drugs. Pharmacology made a change to the Oxy pills and at $1 per milligram, it’s more expensive than Heroine. Heroine is a “one and done” drug, meaning that try it once and a person will be addicted. The first experience with Heroine is usually snorting, not injecting, said Schofield. They can achieve a high, but the more they use, the more they look for a quicker high and transition into injecting it as their drug use progresses. Schofield describes that Narcan has an immediate reaction time. Within seconds someone who was not breathing or had no heartbeat become responsive. They can become combative because they immediately begin going through withdrawal symptoms, eliminating the euphoric effect. The State of Maine’s Attorney General offered law enforcement the opportunity to receive free Narcan to use in emergency settings where seconds matter and EMS has not arrived. All officers were trained on the use of the Narcan. In the six weeks they have been carrying it two officers have used it in the field and saved two lives, said Schofield. All officers who carry Narcan have to do a report every time it is used for tracking purposes. In other communities Narcan has been used five or six times on the same person. One save was the person’s eighth save over his lifetime. It’s a false safety net, according to Schofield. “We are strictly saving a life,” Schofield said. Not everyone is a repeat offender. He knows of people who were saved by Narcan and now work in recovery, helping others battle their addiction. “This is a human life. If someone is allergic to a bee sting, what are you going to do? Give him an EpiPen,” said Schofield. Windham Police Department as well as Westbrook, Gorham, Buxton and the Sherriff’s office have been awarded a grant through the State of Maine to help in carrying out projects designed to reduce substance use, substance use-related crimes and recidivism. Westbrook Police Chief Janine Roberts approached Schofield about the grant, which they were awarded earlier in the month. The plan is to hire a recovery liaison position to help identify persons and families of persons with opiate abuse disorder. They will check on how people are doing coming out of jail, help with treatment and employment opportunities. “The liaison will find resources for them to get the level of treatment they need to connect all the dots,” said Schofield. The goal is for officers to develop partnerships with groups that can help with programs and trainings, according to Schofield. “We have to come at this problem from a different perspective. It will decrease the police enforcement side. It’s much more problem solving than strictly enforcement,” he said. The Windham Police Department is in the process of hiring one officer this year to help with their efforts. 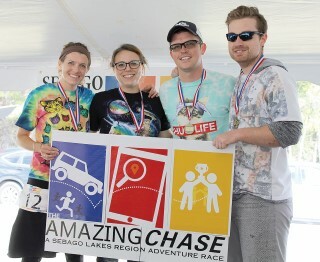 Saturday, thirteen teams and many more volunteers spent the morning racing around the Sebago Lakes region in the first annual Amazing Chase sponsored by the Sebago Lakes Region Chamber of Commerce. The event was a spin off from The Amazing Race on CBS, where challengers in teams of two complete tasks to get to the checkpoint first. In The Amazing Chase, teams of four, compete in activities from singing songs and dancing to climbing a rock wall or fishing for an object at the bottom of the lake in Naples. Teams traveled from Gray to Naples and Limington to Windham to answer trivia and compete in challenges. 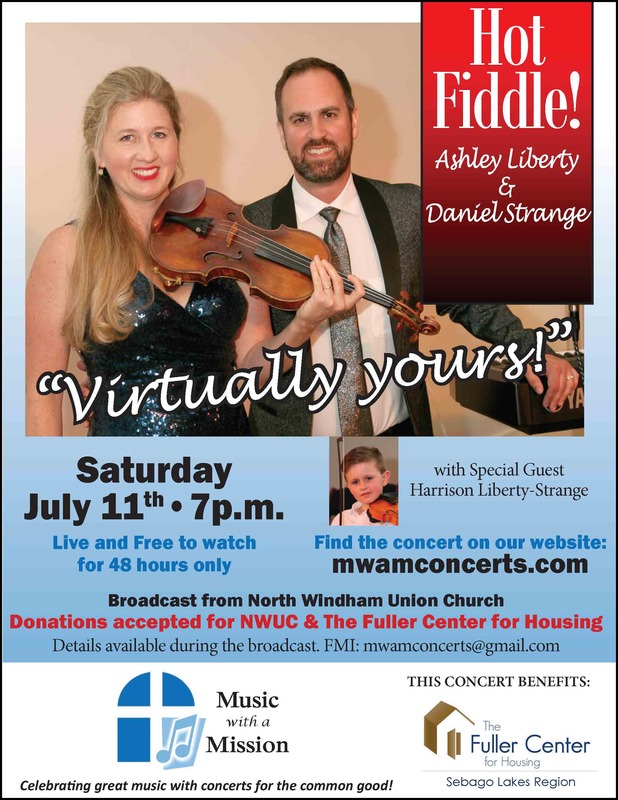 “This was a fundraiser for the chamber. The money raised helps us so we can do the great works we do branding the region and putting the spotlight on the beautiful region we have here,” said Aimee Senator, executive director of the Sebago Lakes Region Chamber of Commerce. “It was a huge logistical challenge. It was the first of its kind and had never been done before,” she said. SmartHunts, the company that ran the technology part of the race usually works with corporations and team building events. This was the first time they had run a race with the general public. The winning team, Sloth Ninjas, made up of Sarah Romac, Sandy Woznicki, Russ Boynton and Brooks Campana, won a stay and play package worth over $2,500 including tickets to the Maine Brew Fest, overnight accommodations at the Windham Microtel, kayaking for four from Sebago Trails Paddling Company, four 1-hour massages from Freedom Massage & Wellness and dinner for four at Franco’s Bistro. Second place went to Headlight AV, who was one of the major sponsors for the event. They won a movie under the starts with all the audio visual equipment donated by Headlight Audio Visual. They donated the prize back to the chamber to be raffled off at another time. Third place went to the Raymond Rockabillies who each won a leather messenger bag from Land Rover, another large sponsor, and Beats headphones donated by Headlight Audio Visual. Other major sponsors were Sabre Yachats and Clark Insurance. One team was chauffeured around the region in a new Land Rover. They were one of the first teams to register and were entered into a drawing. Another challenge for the event was to crowd fund for the chamber’s non-profit Feed the Need, which raises money to help the 13 food banks in the region. Any team who raised more than $200 earned an additional 500 points. “The events attract more people and do better with a charitable component to it,” said Senatore. Nine of the thirteen teams raised $200 or more. Clark Insurance’s team was the top fundraiser at $710. Gorham Savings Bank raised $400. Approximately $2,000 was raised for Feed the Need. The chamber brought in $7,000 to be used for its programs. “It was our goal to make sure the businesses get value in addition to the region as a whole,” Senatore said. Teams have already started planning their strategies for next year and plan to bring more competition. “It was fun for people. We achieved our mission and people learned a lot of things about our region. It was an incredible and memorable day that we can't wait to take to the next level in 2017!” said Senatore. For more information on the race or to reserve your spot for next year, visit Amazing Chase Sebago Lakes Region on Facebook. 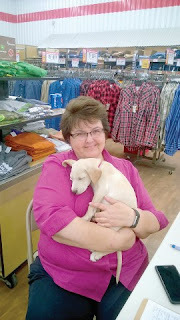 It’s 10:30 Friday night and a dedicated lover of animals is working diligently to prepare for successful dog and cat adoptions the next morning at the Tractor Supply Co. store, 469 Roosevelt Trail in Windham the following day. The devoted individual is Erlene LeBorgne, founder and owner of Maine Lab Rescue in Windham. Like a piece of a massive puzzle, true adoption victory occurs in multiple and meandering ways. Saturday’s event at the Tractor Supply Co. store was no different. 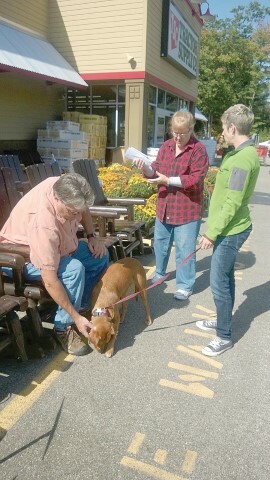 After filling out the adoption application and Garrolds’ references were checked and passed with flying colors, the Garrolds were accepted for adoption and made the two-hour trip from Monroe to meet Prissy. “It was love at first sight,” Kathy Garrold stated, regarding the moment she saw Prissy walking in with her foster family, Angela Littlefield and her daughter, Neve. After meeting Prissy and learning about her easy personality traits and simple needs from Littlefield, the Garrold’s signed the necessary papers and left with Prissy by their side. 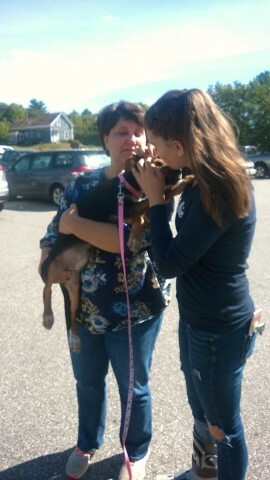 Success and smiles continued on Saturday when foster parents, Michelle Diment and her daughter Samantha got to meet Zarah, a puppy they fostered a month ago, who now has a permanent and loving home in Windham. When asked if she had advice for future animal adopters, Michelle stated, “It’s important to educate and remind people that a puppy is a real commitment. People have a hard time believing or forget that those cute little 20-week old puppy faces will chew up your favorite shoes, go to the bathroom on the floor, or jump on the nice furniture.” However, Diment continued to say that with gentle commitment and training, the puppies grow out of this phase and become the dog people expect. “The same goes for some older dogs. Although they have passed the puppy stages, commitment and patience is still required to teach them manners,” she added. Diment explained that they may have just come off the streets or they have spent a majority of their life in kennels. But with persistence, they too can become an easy loving family companion. The real success on Saturday, however, was the organization itself. LeBorgne explained that Maine Lab Rescue (MLR) is a result of a kitten she adopted from Georgia nearly 5 years ago. “I became aware of the challenges faced in the South and wanted to become part of the solution.” As a result, LeBorgne established MLR in 2012, which is headquartered here in Windham. Macon, Georgia serves as the center of operations in the south. When asked why there is a pet overpopulation in southern states, LeBorgne explained that there are both cultural and financial reasons. “There is often a different perspective regarding spaying and neutering in the southern areas that we assume and take for granted in New England.” Financial barriers also play a large role. LeBorgne went on to say that there are many committed rescue volunteers in George that MLR works with on a daily basis. “They are just as caring, passionate, and determined to find a good home for the dogs that come into their care as we are.” Without them, she said, her job would be very difficult. In fact, Georgia foster parents are available around the clock to give a dog/cat a temporary home until they are transported to Maine on a weekly basis. The adoption process includes an application with references followed by a public meet and greet. Adoption fees for cats are $185.00 and $425.00 for dogs. The adoption fees pay for medical care, spay/neuter, transportation, as well as the day to day expenses associated with operation of the rescue. LeBorgne stated, “We are very grateful that most veterinarians will provide services at a discounted rate.” However, the costs remain substantial. LeBorgne added that there is a constant need for foster parents. For those who are interested, please email foster@mainelabrescue.com. To see the latest adoptable pets, check on the Maine Lab Rescue Facebook page, the website at www.mainelabrescue.com or to view a full photo album, visit www.mlradoptables.com. 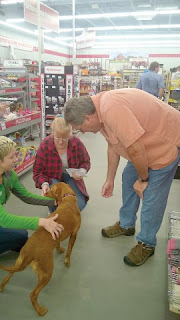 Maine Lab Rescue will have another adoption event at the Blue Seal Feeds, 43 Main St, Windham, this Saturday, September 24th from 11 a.m. to 2 p.m.
It’s difficult to drop everything and help when natural disaster strikes, but that is exactly what Windham resident Ruth Lathrop did in late August, when she deployed as a volunteer with the American Red Cross to help flood victims in Louisiana. “They called me on a Thursday at 4:30 in the afternoon and asked if I could go to Louisiana at 10:30 the next morning,” Lathrop said. She agreed without hesitation. “I didn’t even think about it.” Lathrop had volunteered with the Red Cross locally during the ice storm in 1998, and after some time off had been helping locally again over the past year. The trip to Louisiana was her first deployment. Though Lathrop is retired, she has a part time job cleaning at Birchwood Day School a couple of hours per night during the week. When she told them she had to leave for two weeks, they offered their full support. “They were great about it. They all pitched in down there and covered for me while I was gone,” she said. Lathrop is from South Carolina, and has experienced severe flooding herself. “I had water in my house. I had a boat in my front yard,” she said. Witnessing many natural disasters played a role in her motivation to become a Disaster Red Cross Response volunteer. The trip to Louisiana took three days, and when they arrived Lathrop stayed in a shelter with approximately 200 other volunteers. They left the shelter early in the morning to pick up food and water, which they then delivered to heavily affected neighborhoods. Her team went to the same neighborhood daily, so they really got to know the people there, Lathrop said. When she first arrived, they were serving hot meals to 400 people at both lunch and dinnertime. By the time she left last week, Lathrop said, the need had decreased somewhat, and they were serving about 400 meals at lunch and dinner combined. People affected by the flooding were living in shelters, with other family members, and some were even staying right at their damaged homes. One woman had three dogs, and couldn’t find anywhere to go with them. Refusing to leave the dogs, she pitched a tent in her yard. Even when there wasn’t much to give, people were grateful for any help they received. The first day, Lathrop said, they had run out of hot meals and were preparing to leave. She saw a woman, and had to tell her there was no food left. “She looked up at me and a tear ran down the corner of her eye and she said ‘but I’m hungry.’ It just broke my heart,” Lathrop said. The driver told Lathrop to give the woman whatever she could find, which turned out to be some cookies and crackers and some bottled water. She assured the woman they would be back the next day at noon. What struck her most is the appreciation she received for even those meager offerings. “That’s what I found with all the people down there. They were so appreciative and thankful. Anything you could do for them was greatly appreciated,” she said. Hearing the stories and seeing the destruction up close was overwhelming, Lathrop said. “There is no way you can comprehend when you see it on TV from when you see it in person. You cannot believe the difference,” she said. Meeting the people impacted by the flooding was the most amazing part of the journey for Lathrop. “They were all strong people,” she said. The overall attitude was gratitude to be alive and strength as they talked of rebuilding. After two weeks, Lathrop was ready to come home and rest. Working in excruciating heat was exhausting, she said, and took a toll on her. But even though she needed to take a break, Lathrop said she told the Red Cross that after a week of rest, she would return if necessary. According to a press release, several volunteers from Maine have been a part of the flood relief efforts. For information on how you can help, visit www.maineredcross.org. 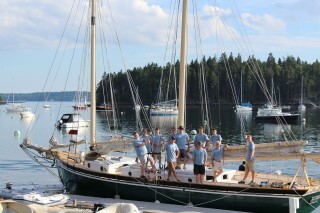 Boy Scouts from Windham’s Troop 805 spend a week aboard a 45- foot schooner sailboat off the coast of Maine. The three adults and eight Scouts left from Buck’s Harbor on the Alamar and sailed up past Mount Desert Island and explored many coves and islands between there and North Haven. 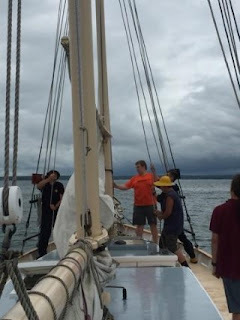 The trip was for older Scouts and they learned a lot about sailing from how to hoist and lower the sails, to raising and propping anchor and how to steer and chart a course, according to Scoutmaster Chuck Libby. “We’d done a trip like this once before under the direction of Captain Tedd Gifford. The boys wanted to do it again,” Libby said. Gifford has been sailing most of his life and enjoys teaching the Scouts. “Sailing builds character. It provides an experience they may not have had otherwise. It builds confidence. 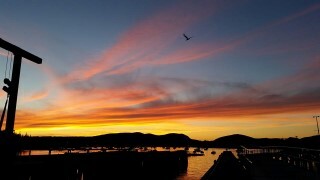 It gives them an appreciation for the beauty of their state and the coast of Maine. It teaches them to fend for themselves but also to be part of a team. 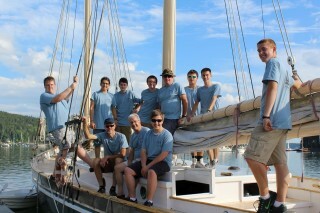 They learn many skills including cooking, cleaning, navigating, tying knots, and the art of sailing,” said Gifford. The boys had the chance to swim off the boat and explore islands that very few people get to see. For one Scout Mackerel Cove on Swan’s Island was his favorite stop. They saw porpoises and a sea lion or two. Libby compared staying on a boat like hiking, where you sleep in a different location each night and “every day brought new challenges.” The space was tight, but they made it work often sleeping on deck for the cooler air and more space. “It’s all about the boys. They did everything. The adults are right there to make sure they’re safe, but that’s it,” Libby said. *Editor Note: Due to some graphic details this article may not be appropriate for some sensitive people. The account is from a first responder who worked at the scene in New York City. Over 100 people joined local first responders at the Windham Assembly of God on Sunday night for a memorial service in honor of those who lost their lives 15 years ago on 9/11. Almost 3,000 innocent victims lost their lives in the terrorist attacks on New York City, Washington D.C. and Shanksville, Pennsylvania, but to this day many who came in after the towers had fallen to clean up the wreckage are still suffering today and looking for answers. Special speaker Raymond Gough, a now retired paramedic for MONOC in New Jersey was a first responder at Ground Zero on that day and he recounted many of the horrifying stories of the workers who toiled over the debris at a place called Fresh Kills landfill. Gough worked for one month at the site and even 15 years later, when he thinks about what he saw, it brings tears to his eyes. “And we uncovered personal remains, police cars, ambulances, fire trucks, badges, pistols, name plates all in this pile. All sights no one should have to see in their lifetime,” Gough said. He and his coworkers found human remains no bigger than a baseball that were used to identify victims through DNA. His goal was to help bring closure to families by finding the DNA. He worked alongside counselors who could debrief the workers, chaplains who worked side by side praying prayers of encouragement and Red Cross workers who stood by to give hugs as they came off the pile. On his way home each night the road would be lined with people holding signs thanking the volunteers for their service. “You’re heroes,” they said. “I tell you, I didn’t feel like a hero that day,” Gough said. By December of 2001, nine victims had been identified by DNA remains that they had found. 9/11 proved to Gough that there was no God. Gough was angry and filled with anguish, he said. After his services were no longer needed at Fresh Kills, things went downhill for Gough and his wife, Dawn. “We went bankrupt. I was a broken man.” He retired after 22 years in Emergency Medical Services. Therapy taught him how to cope. “I never felt the healing. There was always a deep emptiness in me,” he said. His wife asked him to go to church with her, but he refused. “I wasn’t a believer.” When he did finally agree to go, “it was the first time I was ever able to be around people for any length of time in four years. God always knows who need to hear the message,” he said. The sermon was about walking in the light. “I was hiding in the dark for comfort. Living in the light of God was the only thing that would help me,” Gough said. In the case of any first responders, stressful events over a long period of time can add up and at some point the post-traumatic stress will hit them like a rock. Sometimes it only takes one event like 9/11 to cause PTSD. “The first responders see people at their worst. People expect first responders to be miracle workers, but we’re not God,” Gough said. On 9/11 everybody was the same color – gray. “It was humanity, helping humanity. It’s amazing what 15 years has done. Victims helped each other escape and others led others to Jesus,” Gough said. “While they were running out, we were running in. All gave some of their lives, and some gave all of their lives.” Like Jesus, the first responders laid down their lives for the life of the sheep. (John 10:11) he said. First responders and volunteers from Ground Zero and Fresh Kills landfill are still suffering. As many as 1,600 people have died since 9/11 from respiratory issues, cancer and more all from Ground Zero. Sixty thousand men and women are sick, with 4,000 having cancer related to their work, Gough said. “Never forget to place our trust in God and our faith in Jesus Christ. With God there is hope for a better tomorrow,” Gough concluded. Gough is now a pastor at New Limerick Baptist Church having fully accepted that God has a purpose for him. The service concluded with a bag piper playing Amazing Grace. Boy Scout Troop 51 provided the flag ceremony, Angela Searles was the pianist who leads the audience in patriotic songs and three pastors prayed individual prayers for police officers, firefighters, EMS and the military. They try to do special things for them at least once a month in hopes of building relationships with the community. Each first responder who attended was given a book titled, “Hope For My World…the Book of Hope,” which is a paraphrasing of The Bible for them to use in times of strife. Everyone in attendance was encouraged to give the men in uniform hugs on their way out.